Imagine spending a whole string of sunny summer days cruising along like Huckleberry Finn, leapfrogging from anchorage to anchorage on solar-generated electric power alone, without ever having to crank an engine or spend a dime on fuel. Or better yet, imagine being able to cruise along in full-electric mode as circumstances permit, while reserving the option of cranking up an onboard diesel powerplant for a couple of hours to boost speed and outrun a storm or simply top off the main battery bank for a night&apos;s worth of cool, quiet, all-electric air-conditioning on the hook. Futuristic baloney? Not according to a stint of testing we&apos;ve just completed on the newly launched Island Pilot DSe (Diesel Solar Electric) 12M Hybrid, a two-stateroom, two-head cruising cat. She takes maximum advantage of the propulsive possibilities that arise when a matched set of 75-mhp Steyr Motors diesel hybrids (see "Austrian Ingenuity," on page 54) synergize with a 6-kW Sun Power photovoltaic array. In fact, given the nature of the test data collected, the DSe is hardly futuristic at all. 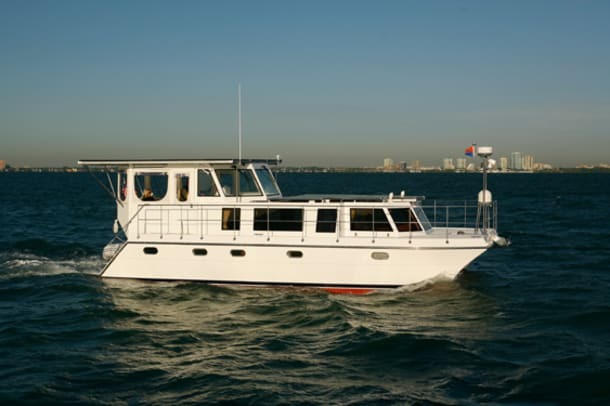 She&apos;s offering a level of cruising efficiency and environmental friendliness heretofore undreamt of—today. But before delving into the facts and figures, let&apos;s take a look at the technology underlying them. 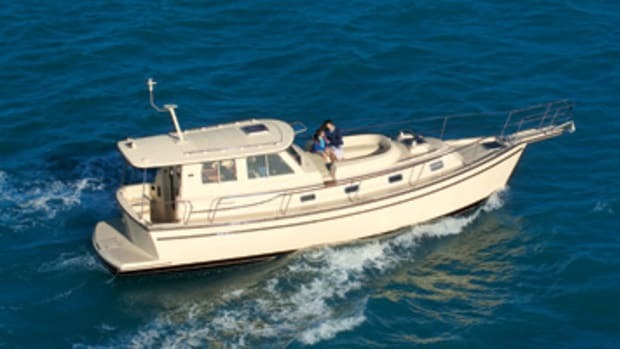 To achieve a thorough appreciation of the DSe&apos;s performance on test day, as well as its implications for modern-day cruising, you need a basic understanding of how and why the vessel&apos;s able to do what she does. "And getting a handle on that," even Island Pilot CEO Reuben Trane acknowledges, "can take a little due diligence." 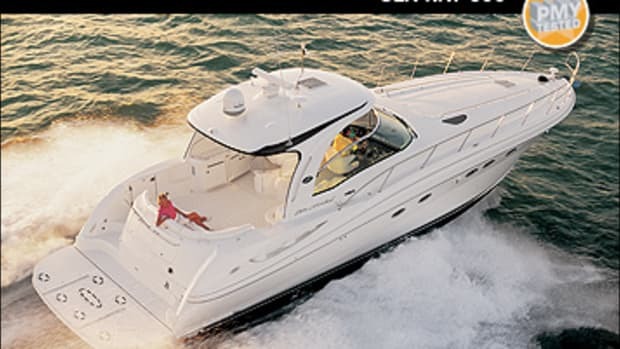 The heart of the DSe is her main battery bank: 16 AGM Group 31 Odyssey PC 2150 batteries. The bank is split into two separate halves wired in series; one is installed on shelving in the bow of the starboard sponson (accessible through a deck hatch) and the other is similarly installed and accessed in the port sponson. The bank tips the scales at about 1,100 pounds, a hefty burden substantially balanced by the weight of the Steyrs aft. Collectively, the bank can store up to 20 kW hours of electrical energy from a suite of green sources: the sun (via two Outback Power Systems controller/chargers that maximize the array&apos;s energy absorption), the wind (future DSes will have port and starboard 1.5-kW Urban Green Energy wind generators), the two Steyr hybrid diesels, each equipped with both a 48-volt D.C. "motor/generator" and a conventional alternator, and, of course, a couple of conventional 30-amp fittings to connect to shore power. 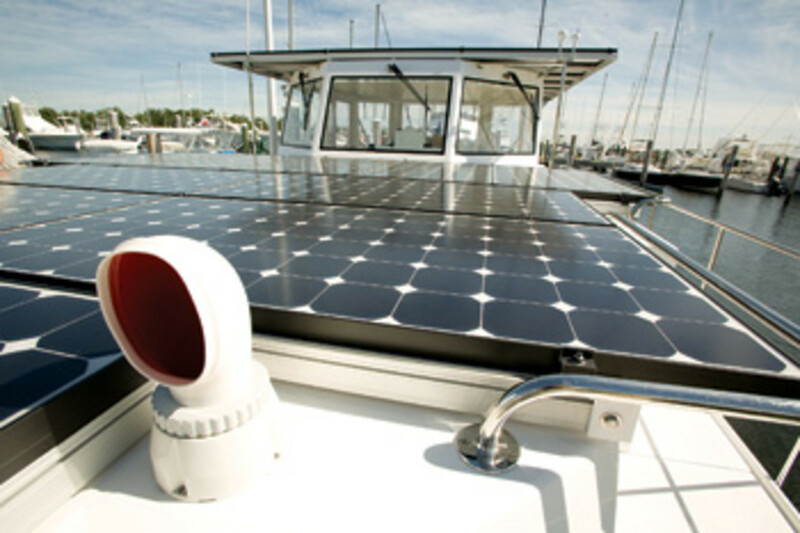 Should air conditioning and other onboard needs swamp the solar array&apos;s capabilities at any time, firing up one Steyr adds 5 kW of motor/generator power; firing up both adds 10 kW. The way the DSe uses, generates, and stores the electricity she collects is as varied as her sources of supply. Most remarkable perhaps is the all-electric propulsion mode. Push a dashboard button, disengaging each Steyr motor/generator from its flywheel, and you&apos;ve got two all-electric 10-hp powerplants that are silent, emissions-free, and either cheap or free, depending on where the electrical energy they use came from. Other types of usage are more prosaic. To energize TVs, appliances, and other equipment, a pair of 50-amp/3.6-kW Outback inverters converts D.C. power from the battery bank to A.C. and then routes it through a pair of 120-volt A.C. distribution panels in the master stateroom. Two Mean Well 48-volt D.C.-to-12-volt D.C. converters tap into the main bank and provide energy for the 12-volt pumps, lights, and small electric motors. Finally, there are the Steyr motor/generators. With a little juice from the collective battery bank they both crank their respective diesels (thus serving as a backup for conventional 12-volt starters) and add momentary oomph to their drivetrains at low rpm. If all this sounds just a tad technical and complicated—well, maybe complexity is the DSe&apos;s Achilles heel, although the system requires virtually no monitoring or manual switching of components or power sources. Yet, the vessel&apos;s on-the-water accomplishments are as straight-forward as dollars and cents. Check out the primary-diesel operating efficiencies we recorded in the lee of the land on a rather windy Biscayne Bay. They generally exceed what modern displacement-type vessels are capable of these days (including power cats), thanks to a pair of sleek, torpedo-like hull forms designed by naval architect George Petrie and a choice of horsepower necessary to achieve displacement speeds, but not exceed them. 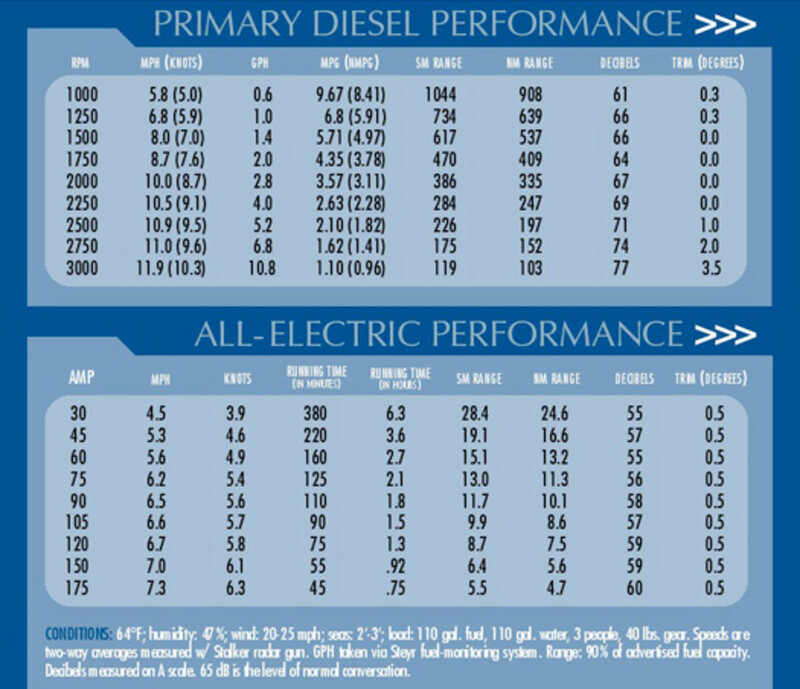 And check out the rest of the primary-diesel data shown on page 51. Certainly running attitudes were rather mild, with a modicum of lift initially and only a few degrees of bow rise toward top end. And sound levels were low, exceeding the level of normal conversation only after the Steyrs hit 2000 rpm. But all-electric is by far the most compelling of the DSe&apos;s operational modes. While full-tilt performance engendered a mere 45 minutes of run time at 7.3 mph with a power draw of 175 amps per half battery-bank, backing off to 75 amps decreased our speed only slightly, to 6.2 mph, and increased our run time to more than two hours. And yes, our run times (and therefore range projections) are "slightly optimistic," according to the engineers at Enersys (manufacturer of Odyssey batteries) who calculated them and suggested power might start to decay at 80 percent of each run time&apos;s total. But it&apos;s important to remember that none of these numbers takes into account energy absorption from the solar array while underway, an unfortunate and somewhat misleading circumstance engendered by the absence of an onboard metering device for the array. 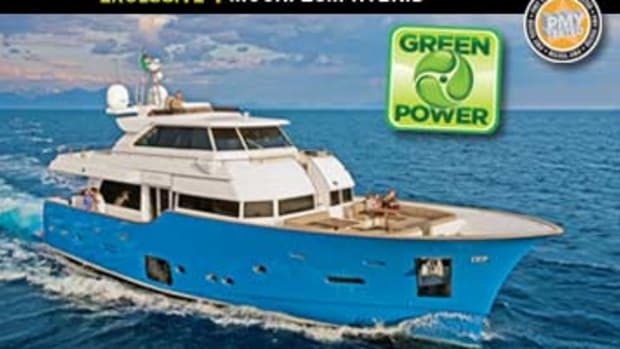 The conclusion&apos;s still stunning, though: Based on data I recorded while operating in all-electric mode, as well as theoretical run-time projections and array capabilities, it seems fair to say that a full day of sunshine might easily yield a full day of solar-powered, 30-amp 3.9-knot cruising. Indeed, just two-thirds of the solar array&apos;s rated 6-kW power (4,000 watts) could keep up with the 2,880-watt drain on the main battery bank at such speed, figuring the drain at 60 amps (30 amps per Steyr Hybrid motor) x 48VDC, in accordance with the formula: Watts = Amps x Volts. 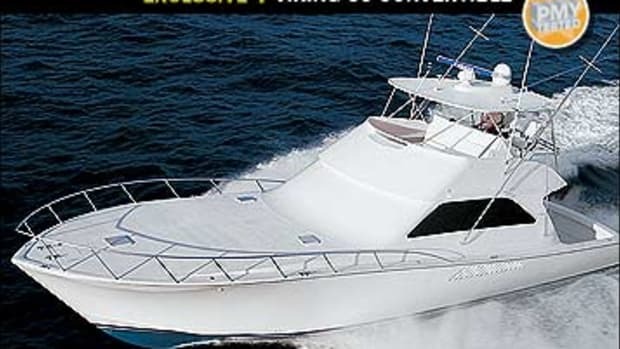 If cruising for free and for fun, even if limited to periods of intense sunshine, has a lovely, unorthodox ring to it, you&apos;re gonna love the actual operation of the DSe. Running the boat from the helm station in the wheelhouse felt quite normal to me, whether she was in primary-diesel or all-electric mode. Visibility was excellent except for directly over the bow where it&apos;s adumbrated by the solar array on the coach roof, a situation Trane&apos;s addressed with a forward-viewing Raymarine video camera that gives the helmsman a reasonable (but not great) picture of what lies ahead. The twin helm seats were comfortable (they&apos;re positioned so a helmsman can sit in either), the Tecnautic digital engine control with fly-by-wire, dial-type steering worked smoothly, and there was plenty of seating for passengers. Docking the boat in all-electric mode was a bit challenging, however, at least while doing so from the foredeck with the Tecnautic remote (with motor-control levers on either side of the steering dial) in hand. Because of wind noise, I was unable to hear changes in the Steyrs or feel them in the Tecnautic&apos;s control levers due to a lack of significant detentes. 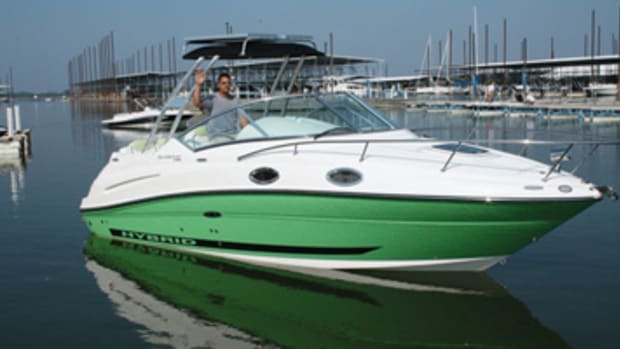 Thus, I had difficulty discerning whether the boat was in forward, reverse, or neutral at any given time, a daunting difficulty with a stiff wind blowing, at least to this neophyte all-electric boathandler. 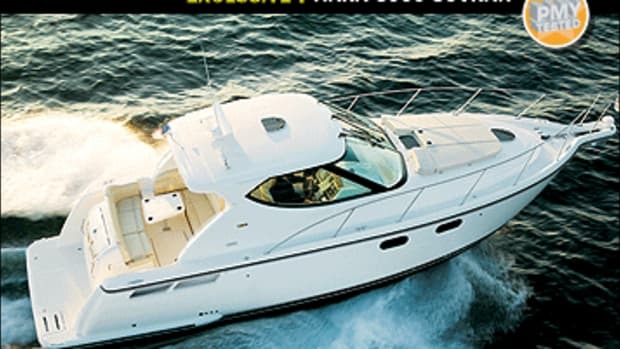 The edginess of the DSe&apos;s technology and performance is nicely matched by the unusual nature of her design and layout below decks. 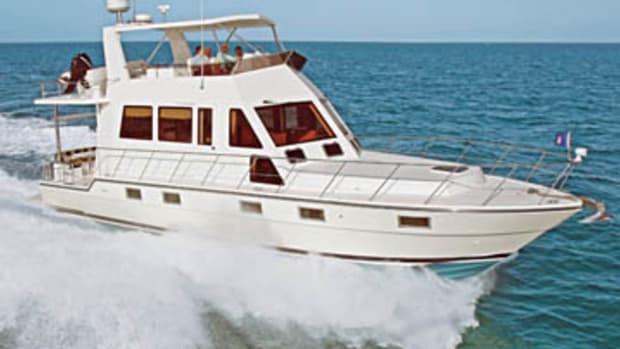 The master forward (with en suite head and separate shower) has a unique and inviting forward-facing queen-sized sleigh bed offering a wraparound view of the foredeck and beyond. The aft guest stateroom (also with en suite head and separate shower) offers mattresses that can be easily configured as twins or pushed together to form a queen. 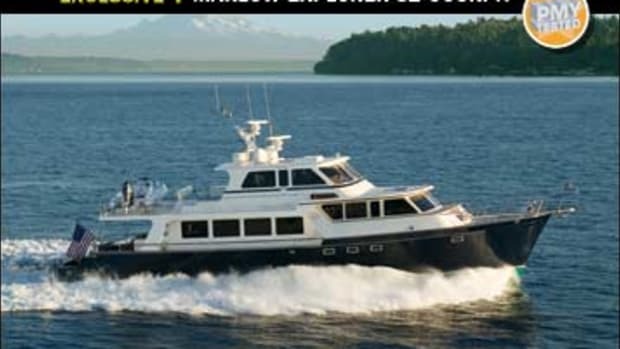 And the "deckhouse," between the master and stairway up to the wheelhouse, proffers a galley with a top-notch Hitachi refrigerator/freezer and Cooktek induction-type cooktop, a modern entertainment center, and a couple of UltraLeather-upholstered settees (one that converts to a berth) with an intervening hi-lo table. Machinery spaces at the rear of each sponson are dealt with creatively. On the starboard side, there&apos;s room to stow a standard all-electric Segway PT while to port, the box-like, easily disassembled engine enclosure is cleverly blended into the cabinetry that supports the guest berth. 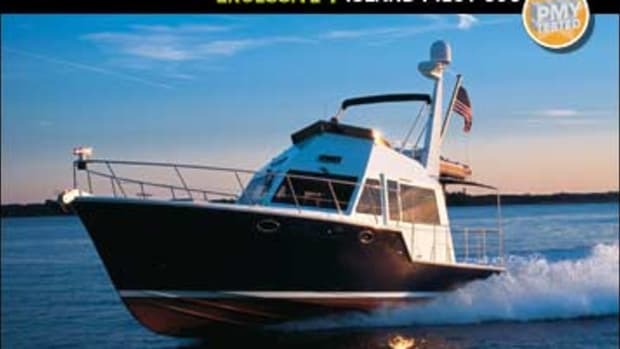 Of course, design and layout below decks are not what the Island Pilot DSe&apos;s all about, and neither is the distinctive, angular styling of the vessel&apos;s exterior. The real story here is that Island Pilot&apos;s come up with a cutting-edge propulsion system. And the luxury of spending quiet, sunny, free-as-the-wind, Huckleberry Finn-type days on the hook? Well, yeah, it&apos;s part of the deal. 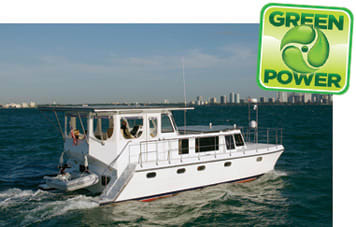 For more information on Island Pilot, including contact information, click here.